The Single currency bounces off the 1.16100 support level after the European CPI figure met expectations. The European CPI remained at 2.0% which was taken positively by the market since this number that represents inflation is now sitting perfectly at the ECB's inflation target. The pair then rose towards 1.16600 following the release of disappointing housing figures from the U.S. Housing starts in the U.S unexpectedly dropped by 12% to a nine-month low while housing permits also decreased for a third straight month. For today, the main driver for the pair would come from the Dollar's side with the release of the Philadelphia Fed Manufacturing Index. Weakness seen from the greenback's side will allow the Euro to rise back towards the 1.17 level for an attempt to reverse the general bearish trend. 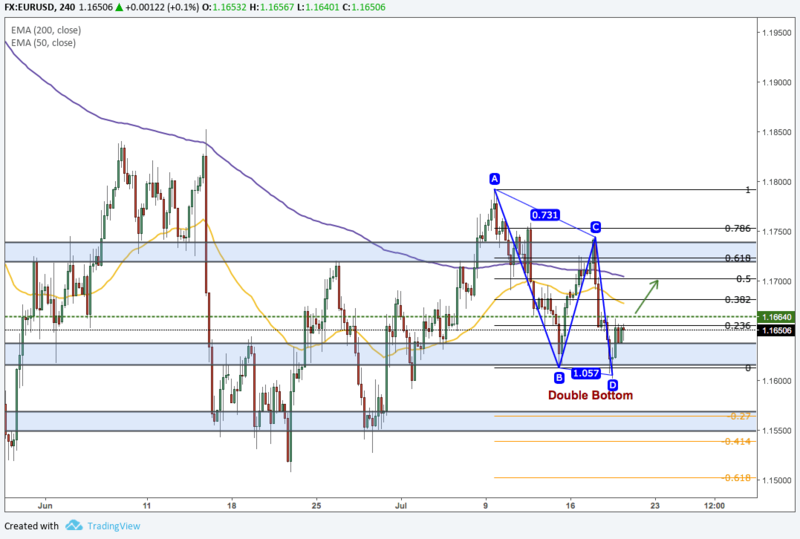 The pair failed to break below 1.6100 and formed a bullish double-bottom pattern. A break above the minor 1.6640 resistance level will pave the way for the Euro to rise towards the next resistance level while testing the 50-period moving average and the 200-period moving average along the way.